As we approach the start of “real” training, this was a good week. On Monday, I went for a run using an app for my phone called HIIT Interval Training Timer. This innocent-looking little program lets you choose an amount of time to warm up, then a set number of repeats of “intervals”. Where an interval is a period of time to run really, really fast, and then a period of time to recover by running more slowly. In my case, I gave myself two minutes to warm up, then eight repetitions of “forty-five seconds fast, one minute of recovery”. It sounds really easy, doesn’t it? Believe me, I came to curse that moment when I could hear the three “beeps” followed by a whistle blast that signified it was time to go fast again. But I did find that I ran the thirty minute route over a minute faster than last time. And apparently this is a good way for helping strengthen the heart, making it better able to deal with the exertion required for the longer runs. On Wednesday, another new app. This one is called Runkeeper, and will be familiar to many iPhone owners. Well, it’s now available for Android. Runkeeper is another route-plotting program, just like Endomondo. Like Endomondo, it offers you information on how fast you are running. But where it scores over Endomondo is that you can tell it how often you want to be told of your performance. Endomondo is once per mile; Runkeeper can be set to anything up to once per quarter mile. It is very useful to know when you are letting the pace drop, so that you can metaphorically kick yourself up the backside and get back on pace. 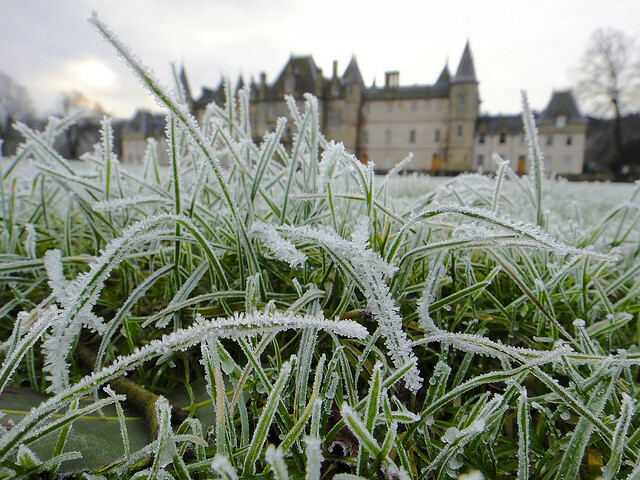 A frosty Parkrun on Saturday! Talking of backsides. When I am running I put my phone into the little pocket in my running tights / trousers / whatever. That pocket is in the small of my back, and is just large enough to squeeze the phone into. When it is telling me my performance, a female voice reads out my distance and pace. It was funny that she chose to speak just as I ran past a couple of older men standing chatting… that must be what is meant by “talking out of your arse”! On Wednesday evening, Life Fit Physiotherapy held an open day at their Grangemouth studio. This was really instructive. Hugh, a biomechanics specialist, demonstrated several fascinating points about stretching and helped me realise that I really do need to (i) strengthen my calf muscles and (ii) stretch my hamstrings. And Arlene very kindly showed me how to do an achilles tendon massage, after which the little niggle at my achilles was totally gone! Saturday was Parkrun day, and I was determined I was going to blow away my previous personal best. I planned to use intervals to get a time better than the 24:05 that was my old PB. Arriving at the car park, I managed to reverse the car into a tree. I have to say that it was not the best start imaginable, and I am going to have to find out how much it will cost me to get a new rear light cluster fitted. It possibly didn’t leave me in the best frame of mind for the rest of the race. to Dougie for the photo! Anyway, I started off trying to do the intervals… and it just wasn’t there. For some reason, in spite of my trying so hard to get my focus in place, it just wasn’t working. I was knackered! But I kept running, albeit ignoring the little voice shouting at me from my bum. “Forty five seconds fast”. Aye, right! The regular pace updates let me know that I wasn’t hopelessly out, and when I got to the final stretch I gave it all that I had… and the result is that I came in in an official time of 23:59 – not great by any means, but still six seconds faster than I’ve managed before! So, that’s another week down. Just one more week of pre-training, and then I start on The Plan! 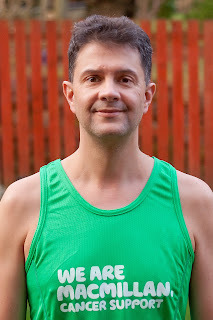 A few people have asked me whether I am running this marathon for charity. I always say “no” because the truth is that I am doing this for me. To me, charity stunts should really be where you donate to show appreciation for someone doing something they wouldn’t otherwise do, and they’re doing it for charity. However, I asked a few friends, and they general feeling was that they thought it would be a nice idea to use the marathon as a vehicle for raising funds for charity. And so, I have decided that I shall invite contributions to Macmillan Cancer Support, one of the “official” charities of the Edinburgh Marathon. Once I have read through the fund raising guide I shall post here letting everyone know how they can contribute. I am sure that I don’t need to spend time telling everyone what a good job Macmillan does of supporting those who have this terrible disease. On the other hand, I have to say that I hate charities badgering folk for money. So, I shall invite – but not push for – donations to Macmillan. Once I’ve learned how! Now I begin to understand the difference between jogging and running. So this week was an exercise in starting the training going. As I said last week, my target was to get three runs in. The first was scheduled to be Tuesday. But on Monday, a friend emailed me and asked if I fancied meeting him for lunch on Tuesday… and already my plans were in trouble. However, on Wednesday I was working from home, and got myself out at lunchtime. I chose a route that included the Wallacestone Brae, a hill that has defeated me every time I have tried it in the past. To my delight, I got all the way to the top without stopping! So I guess that is the bar raised a little; I won’t be allowing myself to stop there again. Okay, it’s only a 250 foot hill, which is nothing compared to what I’ll be facing in the Heaven and Hell half marathon, but it’s something! That afternoon, I travelled to Stevenage for work, and on the following day (Wednesday) I went for another run. Now, this was meant to be a long, slow five mile run. But when I got to Chells Way, it turned out that the road was now entirely blocked by a massive building site. There was an unlit path round the site, but by the time I followed that I had lost all sense of direction, was unable to find Chells Way again and ended up doing a solid, albeit slow, seven miles. A rest day on Friday was followed by an early rise on Saturday to do the Falkirk Parkrun. 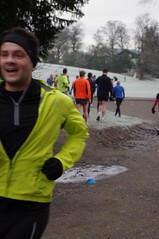 This is a free-to-enter, timed, 5km run round Falkirk’s Callander Park. The route shows off the beauty of this park to its best, and was clear even though recent storms had brought down several trees that were lying to the side of the path. I ran the route with my son, Cameron, and we came home in the respectable time of 30:04 (I forgot to stop my GPS tracker at the finish of the race). I want to take off my hat to the core team and all the volunteers involved in the Falkirk Parkrun, and indeed other parkruns – they are a great idea and certainly help me get out of bed on a Saturday morning. As we walked back to the car, Cameron and I had to dash to avoid being soaked by a passing heavy rainshower. That left me feeling distinctly in need of a stretch. So when I got home I looked at the collection of bought-but-never-used fitness DVDs we have. The one that caught my eye was the “New York City Ballet” workout. If there’s anybody who knows about stretching, it’s a ballet dancer! So, I started the disc going. I just about kept going through the gentle warmup, and then the stretching section. The stretches were actually a pleasure to perform, even though my leg was stuck in the air while the dancers on screen had pulled it way over their heads and, as they lay on the ground, were touching the ground behind their ears with their toes. But then came the abs work… and I realised just how appallingly unfit I have become. I lasted about thirty seconds into the routine. So, I am determined to try to do some of these abs exercises a few times a week as part of my cross-training. All in all, then, a fairly successful week. As my legs get more used to being worked, I think that my knees and achilles tendons are becoming more comfortable with the idea of running. I think that it helps that I am trying to do more stretching to give them a chance. It slightly worries me that I feel I have achieved something by once running three days within a week. In my head I know that I need to do that and more every week for the next four months, but I think that I’m still blocking that out a little. As a side note, I am thinking of signing up to the marathon’s official charity. Macmillan cancer care. What do you think? Is this a good idea to raise funds for a good cause, or is it silly to claim that I’m doing this for charity when I’m really doing it for me? As posted last week, my training for the marathon starts in earnest on 06-Feb. But that still leaves three weeks to get ready for the training, to get used to the idea of going out so many days per week. So, Mondays will become “track my progress” day. I’m going to say what I managed to do last week and what I hope to do in the coming week. It’s sub-zero out there right now. Even when we get through to around lunchtime, it’s still going to be very cold… so I’m hoping that the knowledge I’ll need to come back to this blog and report what I actually did each week will be enough to force me to get out there and run. It’s like so many things – getting started is the hard part. Time is marching on, and I am having to start to think about a training plan. This is something that makes the whole adventure seem a little more “real”. My once-a-week run is no longer going to be adequate, and will no longer have the excuse of “I can’t be bothered” if I fail to go out for a run. So, I spent a fair amount of time looking at various training plans. In the end, I have based my training plan on this one, written by Coach Julie for the Greater Manchester Marathon. 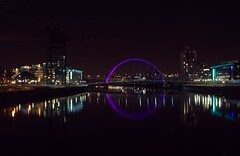 I have two actual half marathon events during the training run – the Alloa Half Marathon on the 18th of March, and the rather frightening-sounding Heaven and Hell race two weeks later, on 8th April. Apparently its title comes from the heavenly flat parts of the run, and the hellish three-mile climb near the end of the race! The profile below doesn’t have distances, but it’s certainly scary! 7 19-Mar Rest Warm up. Cool down brisk walk Rest 6 mile easy with few surges Rest Warm up. 9 02-Apr Rest 6 mile steady Rest 8 mile easy Rest Warm up. 11 16-Apr Rest Warm up. 6 x 45s fast, 3 min jog. Warm down Rest 6 miles. 15 14-May Rest 6 mile steady Rest 5 mile easy Rest 3 mile easy 10 mile easy. 16 21-May Rest Warm up. Warm down Rest 3 mile jog. So, we start in earnest on Tue 06-Feb – just over three weeks away. My plan will be that I will report back every Sunday, taking a note of exactly how close – or otherwise – I have come to achieving my goals. I am determined to be a marathon finisher! So, yesterday my car had to go in for service. Not terribly relevant, except that I decided I would run back from the garage to the house when I dropped it in for service. And then, when it was time to collect the car, I would run to the garage. The only unpleasantness is that, as the Endomondo track shows, there is an almost unreleting hill from the garage to my house. So on the way from the garage back home there was a climb of approximately 300 feet. To my surprise, I still felt fairly okay at the end of it. By the time I went back to collect the car, of course, I had been sitting around all day working, there was a rush to get there and so I didn’t warm up correctly, and when I arrived at the garage I wasn’t going to stand outside for ten minutes stretching now, was I? And so I inevitably have ended up feeling a little the worse for wear today. But at least I got a few miles in! Well, that was a really rubbish run! Something about it just didn’t work. I make no claims to be the most elegant runner around, but in this case I had no style, no grace, no rhythm… everything just felt wrong. I was aware of my running the whole time, conscious of every jarring footfall and every inch of ground… normally I forget about that and just enjoy the scenery. Endomondo Running Workout: was out running 4.34 miles in 37m:34s using Endomondo. Just a short run to see how the achilles tendons were doing. They were okay, but the rest of me was lousy. Like, really rubbish! It was such a relief to see that the stretch leading up to the three mile marker was in fact up hill, because I was exhausted!